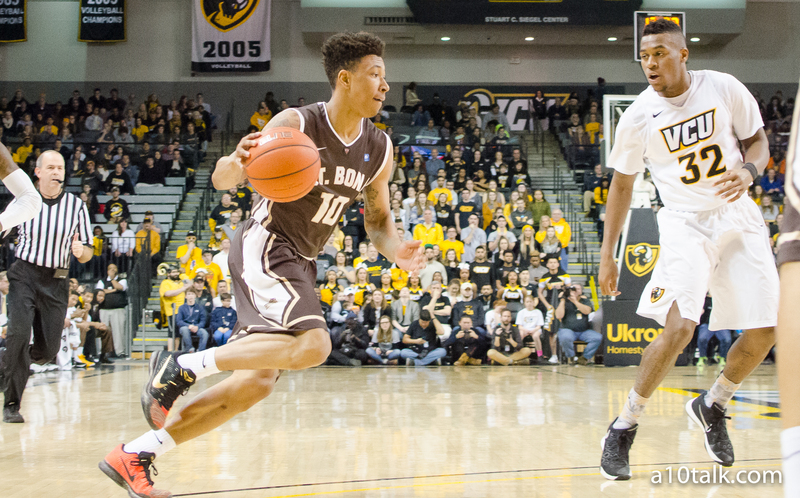 Building off the success of last season, the Saint Bonaventure Bonnies come into the year poised to make a run in the A-10 conference. Of course, conference supremacy is nice, but one thing is on the mind of Bona nation — the NCAA Tournament. After all, if regular season champion and a 22-9 finish doesn’t get you in the tournament, what will? Despite that, Bonnies fans are ready to move forward as this season in Olean could be special. While the losses of Marcus Posley and Dion Wright will hurt, there’s enough guys coming back and new faces finally getting a chance that it isn’t far=fetched to say the Bonnies could even improve on their win total last year. With that, here’s 5 reasons the Bonnies could make the NCAA Tournament this season. This season presents a whole new challenge for junior guard, Jaylen Adams. With Posley and Wright gone, Adams will now be looked upon to be the #1 option on offense — a challenge he’s ready for. Averaging just under 18 ppg last season, Adams proved his hype during his freshman year was no fluke. Named as one of Sports Illustrated’s most surprising college basketball players, Adams should improve his numbers greatly, and may just finish as the top player in all of the A-10. While the Bonnies do lose some key veterans, they also get a few back. This year, A-10 co-sixth man of the year Denzel Gregg ascends into a leadership role and possibly the starting lineup. Gregg has steadily improved on all his numbers each season. If the trend continues, then Gregg should be an excellent complimentary player. Another guy who improved a lot between seasons is Idris Taqqee. This season, Taqqee transformed from a strictly defensive player to a solid shooter and overall three-and-D guy. With such improvement, who knows how much better Taqqee will be in his junior season. Last season, the Bonnies got a number of transfers after a good portion of their team the year prior transferred out. David Andoh, Matt Mobley and Courtney Stockard all decided Bonas would be the best place to continue their careers. Both Mobley and Andoh were forced to sit out the season per NCAA rules and Stockard suffered a devastating injury that kept him out all year. Now, these three get a chance to come in and contribute. Mobley and Stockard both are natural scorers with the latter being a perimeter threat. Andoh is a hard-working forward who crashes the boards and finishes inside. With these three guys now on board, suddenly the losses of Wright and Posley aren’t so problematic. This isn’t your grandpa’s Bonnies. This incarnation of the Bonnies do many things well, but one thing they do better than most — shoot. Last year, Jaylen Adams led the A-10 in three-point percentage with 44%. Along with Adams, the Bonnies shot 37% from behind the arc and averaged 8.3 three pointers a game. Behind Adams, freshman Nelson Kaputo shot just under 36%, while Taqqee shot 35% and Gregg shot 34%. These numbers should all improve next season. Add in Stockard’s 33% from three and you have the makeup of a team that can go toe-to-toe shooting with anyone. Usually, I try to stay away from the emotional reasons, but this can’t be ignored. The Bonnies got snubbed by the NCAA Committee last year. Making history as the highest RPI team to not be selected for the tournament, the Bonnies should be motivated to prove the NCAA wrong. One thing that should be mentioned is Syracuse transfer Chinonso Obokoh. He’s immediately eligible, but coach Mark Schmidt has not indicated how much he plans to play him. If he does play, he should be a huge presence for the Bonnies down low, something the team lacks currently. Overall, St. Bonaventure has the makeup of a team that could make some noise in college basketball’s most coveted event. The pieces are in place, it’s up to them to put it together. Follow us on Twitter and like us on Facebook for more St. Bonaventure news and articles! Matt Mobley is a great three point shooter as well. Stats didn’t support that at 29%, but personally, I believe he’ll shoot well this season, just couldn’t put him in there at 29%. Thats not accurate at all! Mobley shot 35.7% from 3, in 2014-2015, and only 29.1% in 2013-2014!.. He was the #1 option on a team that only managed 5 wins total, and he didnt have much help outside of McMillan.. Mobley also put up 30 plus pts against a stingy Maryland defense that yr too, and he had to take a lot of shots to try too come back from a lot of deficits.. Being on this Bona’s team with the depth we have, Mobley will be able to look and find some quality shots, and won’t be forced to throw up some ill-advised ones.. He’s a great fit to try too help replace Posley (tho theres no replacing the leadership that Posley brought).. Apologies, I was looking at his freshman data, not his sophomore data. My bad. No worries! I was just correcting it because i wanted the other A10 teams to know what we have in Mobley!.. Bona’s always get discounted (or are taken lightly) going into every season, and i can’t help but feel that being the third smallest program in Div 1, cost us a NCAA Bid. And i just want our Bonnie’s to get as much recognition as possible, before the season even starts!